United Nations University ,Tokyo, Japan acknowledged the operation of a Regional Centre of Expertise (RCE-Tirupati) on ‘Education for Sustainable Development’ under the Chairmanship of Prof.R.Ramamurthi. The Foundation is being launched at Orion Hall of Hotel Pai Viceroy on Oct 1st 2015 at 7.30 pm. 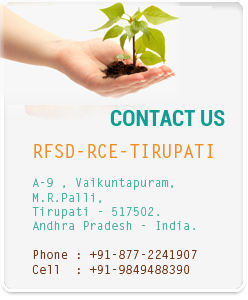 An Interaction and Brainstorming session is scheduled on 13th February 2016 at Regional Science Centre,Tirupati to exchange ideas for moving forward on 'Promoting Environmental Awareness in students and local communities'.The video is follow.